The version of this Tamron 16-300mm f/3.5-6.3 Di II VC PZD Macro lens I had to test was fitted for Canon EF-S, so I chose to mount it on an EOS 70D – being perhaps at the upper end of the kind of camera with which we might expect this lens to be used. Extended or contracted, the lens makes a fine mate for the body. The two balance well, and while somewhat heavy for all-day carrying, it is no worse than most enthusiasts are prepared to lumber themselves with. The lens is not especially small until one considers the focal range it covers, but it has a deceptive look of a lens that should be small. In fact, when collapsed to 16mm, it is not much longer or broader than we might expect a 90mm f/2.8 macro lens to be, and, apart from the dual rings, it does not look especially unlike one. 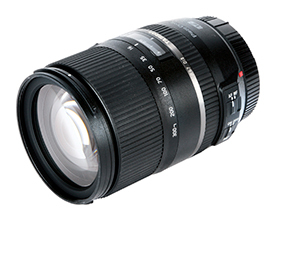 Its ability to double its physical length when set to the 300mm mark is quite surprising, because this 16-300mm f/3.5-6.3 macro lens does not look like a mega-zoom lens. I was expecting something a little more brash and bulbous, more along the lines of the 150-600mm optic from Tamron’s SP series that I tested in AP 12 April. This model, by contrast, is ‘quietly designed’ and features a remarkably narrow barrel with a 67mm-diameter lens cap. It is designed to look small, and it does. Tamron has used the same rectilinear grid pattern for the zoom and focus rings that we have seen in previous models, with the zoom control forward of the focus. These feel good to the touch and are easy to grip and turn even with thick gloves. A focus-distance scale sits between the two rings beneath a glass viewing window, creating a decent distance to distinguish one from the other when our eye is to the viewfinder. A rotation of a little over 120°, or a third of a full turn, takes the focus from 0.39m to infinity. The build of the lens seems solid enough, and there’s not too much wobble when the three-part barrel is fully extended. The supplied hood is a little squidgy, but that flexibility may well protect it from breaking when under pressure. A lock is provided that retains the barrels when stowed in the ‘home’ 16mm position, but it seems hardly necessary as, in this factory-fresh unit at least, there is more than enough resistance to counter the draw of the Earth’s gravity when the lens is pointing down or up. The construction is a pretty complicated business, with 16 elements arranged in 12 groups. 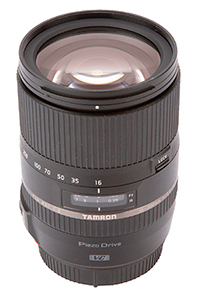 The more significant area is inevitably at the front end, where Tamron has used an element of only about 60mm in diameter made from the company’s ultra extra refractive (UXR) glass, the refractive properties of which are claimed by Tamron to play an important part in the miniaturisation of the whole unit. An additional forward lens is made from extra refractive (XR) glass, and there are four aspherical lenses to ensure good sharpness and contrast from all that light passing through highly refractive elements. The Nikon and Canon versions of the lens have Tamron’s Vibration Compensation (VC) system, and these and the Sony-fitted model (which will be introduced at some time in the future) feature the so-far excellent Piezo Drive (PZD) near-silent and fast AF motor. Tamron doesn’t go into a lot of detail on the subject of exactly how moisture-resistant the lens is, but there is a rubber skirt around the mount that should seal at least the join with the camera.